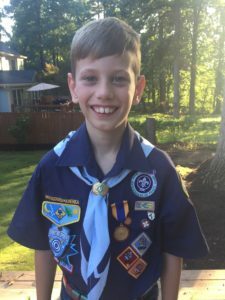 This story was submitted by Abigail Krieger, a parent in Pack 846, chartered to Sugarloaf United Methodist Church in Duluth, GA. In April of 2016, some families took our kids swimming at Buford Park in Buford. We had 13 kids and 4 adults with us. It was a nice Spring day and the kids were in the water. The water was low and the kids were playing on a large floating dock support that had dislodged and washed ashore. All of a sudden, we heard one child, Tatum Johnson, screaming. We couldn’t tell what she was saying. In the moments it took us to figure out that she was yelling, “Roman’s in the water!” my 7 year old Wolf Scout, Bobby, jumped into the waist deep water and lifted the 2 year old up. He had fallen off the back of the dock and his flotation device caused him to be face down in the water. By the time his mom got to him, he was in Bobby’s arms being walked to the shore. He was soaked to the top of his head, but still breathing. We know he had been all the way under water, but everyone was relieved they he came up safely. Thanks to the quick thinking of his sister, who screamed for help, and Bobby who leapt to action, we continued our enjoyable day at the lake. Both children simply stated that they didn’t do anything heroic, they just did what needed to be done. Bobby Krieger was awarded a National Meritorious Award for his actions that day.